One pest control manager was briefing me about his upcoming AIDS LIFECYCLE: Ride to End AIDS bike trek that would take him from San Francisco to Los Angeles. More recently, he’s been keeping his supporters updated daily on his adventure bicycling down the coastal highway starting in the early morning. I was fascinated by a story he shared about a community along the route that in past years was very antagonistic toward the AIDS cyclists and how attitudes in that community were changed by reciprocal gestures to help with the struggles in this community. 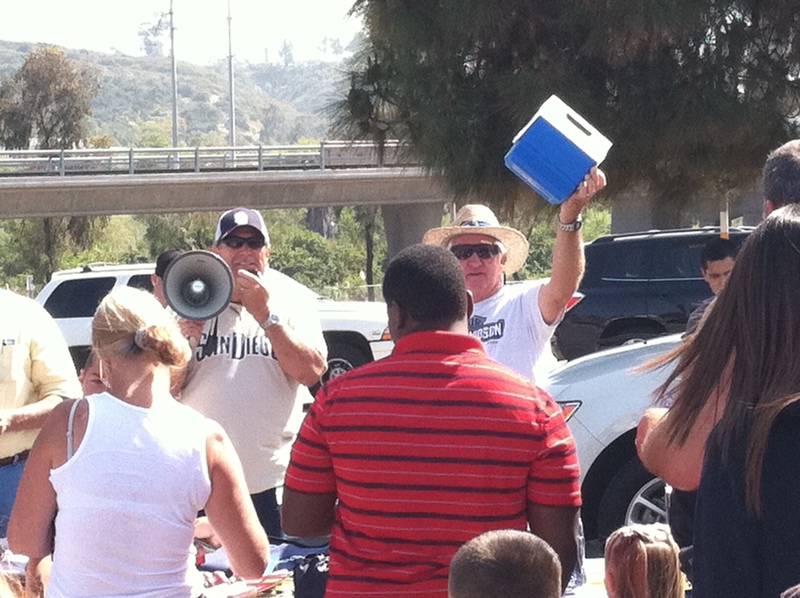 The most bizarre part of the tailgate party at Qualcomm Stadium was seeing an army of families carrying brooms and dust pans. (My kids tell me not to do things potentially embarrassing or awkward, but I did it anyway). With unquenched curiosity, I went over to one family and asked them, “How do the Chargers get such avid fans that they are willing to clean the stadium and parking lot?” Mind you this was no ordinary cleaning. These folks were removing gum from the concrete! 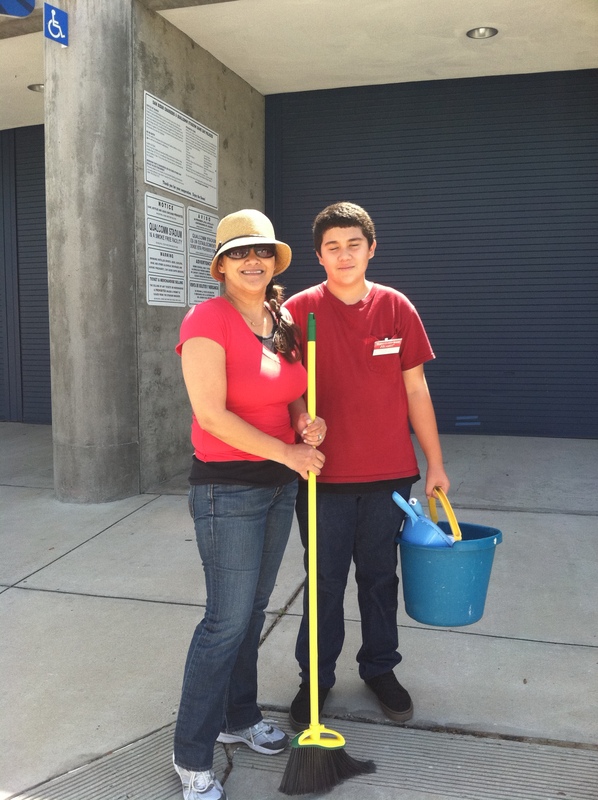 Jehovah’s Witnesses prepare Qualcomm stadium for convention with a scrub cleaning. Wouldn’t it be nice if we all left a trail in our lives marked by the ways we improved the lives of others, (most importantly, our family members, who are often neglected or abused), extending to communities and organizations in need. For most of my early life I volunteered extensively, from wheeling non-ambulatory military hospital patients to church on Sunday mornings to volunteering my farm labor in Israel. As the kids grew up, I was active in community politics, but regretting that I wasn’t more active in general community volunteer drives. Still, working full time while raising two children in a two earner family involved more time than one could imagine. If I could change one thing, it would be to have had the family involved helping others in some way, each and every week. With the creation of Hearts Pest Management, Inc. and its early struggles and growth, I became less active in the community. An important goal beyond the primary task of company survival, was to improve the lives of my employees. In this manner, I have continued to give back. Now, as the company prospers, it feels really good inside to give more financially. Without mentioning names, I see several companies in the region who lend their name to botanical societies, university foundations and many other non-profit organizations. It’s easy to find a cause worthy of your contributions. And it feels darn good to open ones’ wallet for these causes. As an activist teenager, I used to scuff at the elders who gave their money and not their sweat. But now I realize it is part of the natural course of life that as we mature we have less time and more capital – hopefully. It’s the younger generation that gets out in front of causes, while the older generation does their best to financially back those noble efforts. This entry was posted on Monday, June 25th, 2012 at 8:37 pm and is filed under Corporate Social Responsibility. You can follow any responses to this entry through the RSS 2.0 feed. You can leave a response, or trackback from your own site. Excellent blog. I really like the article on the coastal bike ride for AIDS. I think here in Oklahoma my pest control company needs to offer some time for some cause. I’d like to get more involved in the community that treats my business so well. There is no better time than now to begin. In this economy there are lots of people with all sorts of financial and medical issues. Even small companies with little time can find simple ways to give back. Thanks for sharing and keep coming back.